Updated March 2006. This is a general guide, if you require more specific advice please get in touch. The Severn can be divided into two parts, the navigable reaches from Stourport downstream, and the natural river from Stourport upstream into Wales. In the summer this part of the Severn can provide sport with pike, chub and perch plus very occasional trout and salmon. The banks are often steep and difficult making for tiring fishing, the best swims are often occupied by barbel anglers and coloured water largely kills sport. 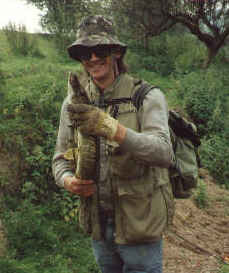 Back in the early 1990s there were many of pike and chub, some days the river seemed alive with pike, numbers have fallen dramatically along with the numbers of baitfish, and chub are not present in the numbers necessary to provide good lure sport, this may have been caused by a succession of heavy winter floods, the large beds of water crowfoot are no more. There is plenty of variety in swims with varying flows and depths usually two to five feet with occasional deeper holes. At normal summer levels the water clarity is about 3ft. The pike will take just about anything you use: spinnerbaits, spoons, topwaters, shallow diving crankbaits and minnows all produce. The average size of pike is quite low with doubles not easy to find. Chub were plentiful in the 2 to 3.5lb class, note the water crowfoot beds. Small but lively pike are great fun from the weeds and fast currents. For an entertaining mixed session I recommend a rod casting 10 to 50g and a small assortment of lures: apart from the spinnerbaits, spoons and bar spinners mentioned above I would take Big and Midi S, Heddon Meadow Mouse, Bagley Topgun, Manns -1, a surface prop bait, Cordell Ripplin' Redfin as well as a few odd minnows. Line strength needs to be heavy enough to deal with the weed. The speed of the current means that jerkbaits and some topwaters cannot be used effectively in many swims. Note: This advice was written based on the river in its early 1990s condition, I honestly do not think it is worth fishing now (2004). I have not had any success on this part of the Severn in the winter, a little extra water makes all the swims seem the same. Catching the river just right might provide some sport, but that is largely a matter of luck. The lower Severn - the navigable river below Stourport - is less picturesque than the wilder upper river, but it still offers good quality lure fishing for pike when levels are normal. The weirpools can provide lure fishing of a very high calibre for chub and pike. Zander are common downstream of Worcester, big perch are scarce and salmon are making something of a recovery now, after they became scarce. Weed growth is limited and localised, depths vary down to about 20ft, with 8 to 14ft being normal in the middle, banks are steep. The dramatic fall in numbers of pleasure/match anglers using the river means that many swims are not used any more and the banks have become overgrown. 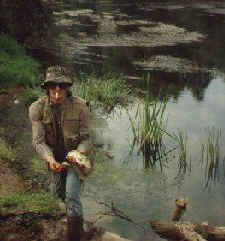 The number of snags and the nature of the banks makes fishing from the bank a difficult game. At normal level water clarity is about 1ft, it can be as much as 6ft in exceptional circumstances. Fishing from a boat often produces plenty of pike up to high double figures, with the majority of fish in the 5 to 13lb class. Covering the same areas from the bank produces notably fewer and smaller fish, and an increase in lost lures. Downstream from Worcester there are good numbers of zander and they provide plenty of sport with most fish in the 1-4lb class but fish to 8lb not too unusual, and there may be record swimming in there somewhere! The best chub fishing is in the weirpools with fish to over five pounds possible. 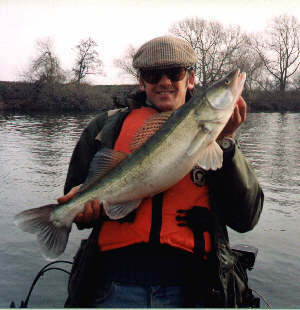 A 9.05 zander from Tewkesbury (1998). There are few opportunities to use topwaters but there are some locations where they can score, otherwise, nearly anything goes. Size matters, you will catch far more, and bigger pike on lures in the 5 to 9" range, than you will on small lures. Spoons, spinnerbaits, crankbaits and jerkbaits (when the water is clear enough) will catch pike but for bank fishing you have to bear in mind the nature of the river bed and avoid sinking lures if you can. Successful plugs include: Bagley Monster Shad (very snag-prone off the bank) and Rapala SuperShad Rap, but the pike are not fussy. The river below Tewkesbury fishes well all year round but heavy flooding often stops winter fishing. In some winters we are unable to launch our boat from October until the season ends, but normally a little extra water and colour do not completely kill sport. Mixed-species fishing with smaller lures from the baot regularly produces 4-species days in summer. I would imagine that the quality of lure fishing from a boat on the lower Severn is comparable to anywhere except the very best rivers, and although the chances of a very big fish are low, the average size is quite high with roughly 3 out of 10 fish beating double figures. The prettiest of the three rivers and the trickiest to lure fish because it is clear and shallow. At normal summer level water clarity is about 3ft. Chub and pike, with perch and wild brown trout provide the entertainment. There is a good head of pike and of a good size but they are very wary and easily spooked. Chub are plentiful but top weight seems to be about 3lb4oz, although I did once see a brace of chub that looked at least four pounds each just above Eardiston Mill, but they were impossible to approach. Since barbel became well established the quality of chub fishing has declined, old guide books tell tales of frequent 5lb+ fish, they are not there now. Fishing the Teme is all about stealth and agility, the banks are steep and overgrown while the fish have radar. The pike usually take spoons and spinnerbaits in preference to plugs but topwaters work in the summer. The chub of the Teme are suckers for the Meadow Mouse in the slower swims and bar spinners in the pacier runs. Teme perch, like perch everywhere, will take bar spinners. This Teme double took a spinnerbait on the drop in about 5ft of water tight to the far bank. Note that I had hair back then in 1989! Overhanging branches, horrible snags and too many barbel fishermen in the best swims are the principal	problems, with the added difficulty that 6" of extra water make the river unfishable. Strictly a summer/autumn venue, winter is hopeless. Lightweight tactics can provide pleasant sport, I confess's to occasionally spinning for trout in the closed season and enjoying the accidental chub, pike and perch that come along, but there are a few trout up to 1lb8oz to be caught. I return them but they are greedy for maggots and the swimfeeder brigade do not share my sentiments. 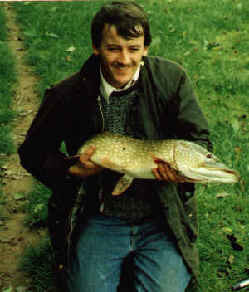 I haven't fished the Teme for a few years now, the pike are too difficult and there are so few available swims. These notes apply to the river downstream from Evesham to its confluence with the Severn. The Avon is probably the easiest to fish of the three rivers, generally flat banks provide easy access and a good head of zander provide a viable alternative to pike. 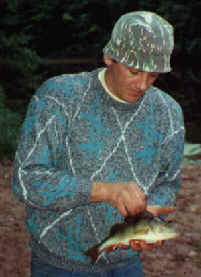 Perch are common but usually small and chub much scarcer. I suspect that the zander compete for food with, as well as prey upon, perch and chub. The river is generally slow-flowing with depths in the middle usually 6 to 15ft and heavy marginal weed growth consisting of lilies, reeds and rushes, at normal level clarity is about 2ft. The pike are plentiful but not large, 3 to 6lb is the average with anything above 13lb very scarce, spinnerbaits are the magic lure, if they were all you used you would seldom blank. But the best fishing is in the weirpools and spinnerbaits do not cast well enough to reach some of the swims and they do pick up snags. Spoons are surprisingly poor, bar spinners are quite good, jigs can be very good sometimes. I have used all sorts of plugs and caught with just about everything, despite the low average size of the pike I've found the sport notably better with bigger lures. Avon pike are usually small but obliging, spinnerbaits are very reliable. Zander are common and quite obliging. Location is the problem, they do wander around and you could be a long way from the nearest one. I describe zander techniques elsewhere on these pages so I will not go into depth here. The weirpools are important locations for zander and usually some will be present at some time of the day. Sizes generally 2 to 4lb but fish to over 19lb are present. Mixed-species fishing with small lures often provides very lively sport from the boat in summer and early autumn. The Avon is interesting because no matter what lure tactics you adopt it tends to provide some sport, less prone to flooding than the Severn it can provide year-round lure fishing. If you plan to fish any of the above rivers I recommend that you buy a Birmingham Anglers Association permit. This will give you access to many miles of good fishing on all three rivers it costs a little over £20 and runs from January 1st to December 31st. Many of the better stretches may have contests at the weekend but the venues and sections are published in advance on the website. Weirpools on the Severn can usually be fished on a day ticket, but sometimes only outside the salmon season.